A marriage is a formal and legally recognized union of two people who are in an intimate relationship. This union establishes the rights and obligations between the individuals. On the other hand, a common-law relationship is one in which two people live together in a conjugal relationship for a period of time without formalizing the union. In Canada, common-law relationships legally fall under provincial jurisdiction. That is why the definition of a common-law relationship differs from province to province. For example, couples in British Columbia must live together for 2 years, while in Ontario they must living together for at least three years before they will have common-law standing—the exception being in cases where a couple has a child. In those cases, a couple in Ontario will then be considered common-law partners after living together for a year. Furthermore, in British Columbia, common-law partners are granted the same fundamental rights as married couples but this is not what the law dictates in Ontario. If a common-law relationship in Ontario ends, you will not have some of the protections married couples do. In a common-law relationship, you will not benefit from the protection of the family residence if the ownership or lease is only in the name of your partner. This means your partner can make decisions regarding the home without your knowledge or consent. If you separate, you will not have a right to a division of property. Property refers to everything you own including real estate, vehicles, personal and household items, bank accounts and other financial assets. At the end of a common-law relationship, each person will leave with only the things he or she owns. When a married couple decides to get a divorce, one spouse may request that the other pay spousal support. Spousal support is money that is given by one spouse to the other to help him or her meet financial needs. Common-law partners do not qualify for spousal support. In a marriage, if one spouse puts him or herself at a financial disadvantage by contributing to the other’s wealth, that spouse might receive compensation if the marriage ends in a divorce. This compensation which is called compensatory allowance is not given to common-law partners after separation. If your partner dies without leaving a will or if you were not mentioned in his or her will, you will not have a right to an inheritance. How can you protect your interests in a common-law union? You and your partner may use a contract to agree on aspects of your relationship while you live together. This contract should also determine what will happen if you separate. You may use the contract to address matters such as division of property, a compensatory allowance and support payments. A protection mandate is a document that contains instructions for how a person should be cared for and what should happen to his or her finances if that person is no longer able to make decisions for him or herself. It is good for every adult to have a protection mandate, not just those in common law partnerships. A will is another important document every adult should have, including those with a common-law partner. This legal document expresses your wishes for what should happen to your estate following your death. You should also include your common law partner in your insurance policy. That way, in the event of your death your common-law partner will receive financial assistance. Do you need help protecting your rights in a common-law relationship in Toronto? To ensure your rights are protected in a common law relationship in Toronto, you will need to have a solid plan in place. 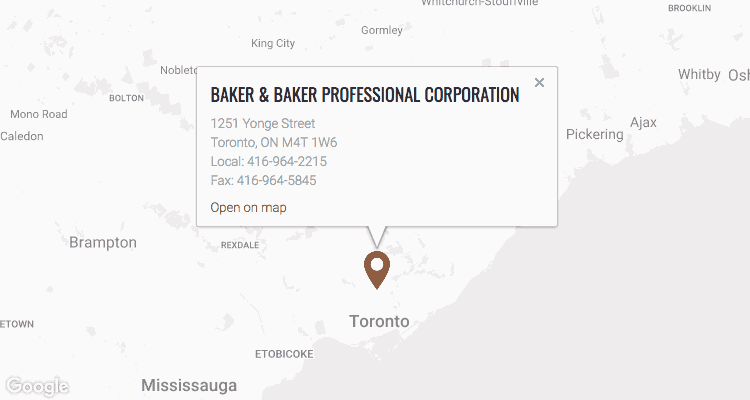 If you need assistance to put your affairs in order, give us a call at Baker & Baker Family Law. Our team has over 90 years of combined experience in dealing with matters concerning relationships. Therefore, we are well-equipped to help. So, what are you waiting for? Contact us today.